When EY set out to define our site, we knew that Rosemary Mudry would be a perfect consultantif we could get her attention away from her action packed life of teaching High School Spanish, Coaching (and playing) Field Hockey and Track, Traveling & Hosting Parties, all while pursuing a Masters in Urban Planning. 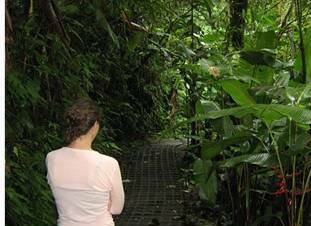 Hiking in the Monteverde Cloud Forest in Costa Rica, Rosemary Mudry contemplates her next steps. EY: You have so many interests. How do you decide where to put your attention? Rosemary: You are right. There are so many issues I feel passionate about. I’ve found that when I do it my own way, follow my own heart, and make decisions that feel good and make me happy, life is good. EY: And it shows in the choices you’ve made! So what’s next? Rosemary: Well, I’m continuing to pursue my passion for Latin America through travel. This summer I’m heading to my favorite city: Buenos Aires. I love the pulse of the city; it’s busy but not crowded. It’s cosmopolitan, culturally rich and also full of quaint tree-line neighborhoods. I love the way they speak Spanish, the delicious steaks and that there is a cafe on every corner. This trip I’ll also have a chance to visit their Wine Country- Mendoza…I love the Argentine Malbecs! EY: We’ll look forward to a full report!